I’ve long proclaimed my love of farro. I especially love its chewy texture and the way it absorbs flavors while still maintaining its own subtle nutty taste. A perfect grain for make-ahead salads. As I was leafing through the latest Food & Wine magazine this weekend, unhealthy I spied a recipe for a prosciutto cafilulower farro salad and immediately bookmarked it. I bookmark a lot of recipes on websites, website in magazine, resuscitation in cookbooks. I email them to myself and print them out, but never seem to get around to making them. Mostly they sit in my Inbox, or get sandwiched between my cookbooks for months. So, I think this might be a record for me. Bookmarked on Sunday, eating by Tuesday…It looked that good. But as with every recipe, I couldn’t leave it alone. In fact, I swapped some of the ingredients and left most of them out. They just didn’t seem necessary. Instead of cubed prosciutto (cubed prosciutto is wrong – very, very wrong), I used bacon. Really good Niman Ranch Applewood smoked bacon. I love the sweet smokiness it added to the salad and it played very well with the cauliflower. I also added some arugula because a salad needs its greens, and some lemon juice to brighten it up. I had this salad for lunch and absolutely love it as main dish. It’s rich and hearty, but still feels light and healthy. How can it be? I don’t know. It just is. Update: Added pecans to this, which made it even better. To make a lighter version, simply substitute 8 slices of Canadian bacon for the bacon (browned in a skillet) and roast the cauliflower in the oven until it begins to brown (about 20 minutes at 400°). To enhance this version, add a handful or two of walnuts or pecans. Some crumbled goat cheese might also be nice here. In a large skillet, sautee the bacon over medium heat until crisp. Remove to a paper towel with a slotted spoon, but leave the fat in the skillet over the heat. Add the cauliflower florets to the skillet and sautee for about 7 minutes, or until they become tender and begin to brown slightly. Remove the florets to a paper towel with a slotted spoon. 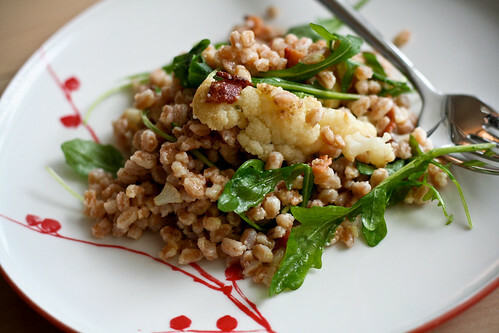 Let the bacon and cauliflower cool, then toss with the farro and arugula. Drizzle with the olive oil and lemon juice, then sprinkle with salt and pepper. Toss until the salad is evenly coated. Top with pecan halves. Serves 6 as a main dish. 8 – 10 as a side dish. *I buy pearled farro from Whole Foods (in the bean section for some reason). The package asks you to soak it overnight. I just add about 6 cups of water to the 16 oz. that come packaged and boil for 30 – 40 minutes, or until the farro is tender, but still somewhat chewy. Drain off any excess water, cool and you’re ready to make a salad. Oooh, this salad looks spectacular! Amazing flavour combinations! WOW!!! Mel, this blog is awesome. You have such brilliant ideas. I just have one question. Who takes the pictures? is your husband Tom a professional photographer? Mel! I made this last night and it was AMAZING. It was part of a perfect autumn meal: slow cooker pork chops, apple chutney and horseradish carrots. You were right though…your farro dish was so delicious it could have been a meal by itself! Thank you!